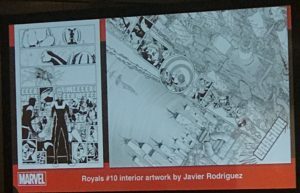 From the early morning of Day 1 of NYCC, where Marvel kicked off their circus with a Retailer Only Panel discussing everything coming under the Marvel Universe all the way through to the end of Day 4 where Marvel Celebrated its Women and also, Jack Kirby, “King of Comics,” it was hard to pass an hour without being able to see something that touched the Marvel Universe. 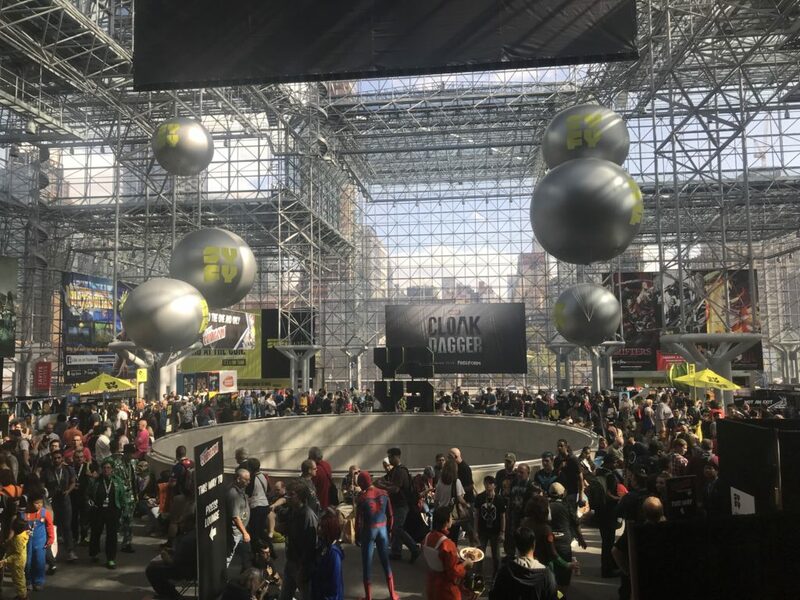 If you were at NYCC, you’ll know that not even the mighty Jacob K. Javits Convention Center can hold all of the festivities and for the truly epic presentations and screenings, patrons are redirected down the street to The Theater at Madison Square Garden. 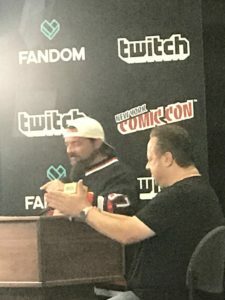 It was here that Marvel was supposed to debut its newest crown jewel, The Punisher television series, coming this October to Netflix. 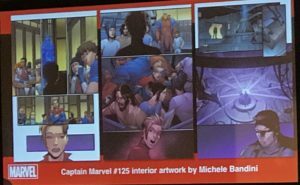 However, a few days prior to the start of Comic Con, the horrific mass shooting in Las Vegas which claimed the lives of 59 people and injured over 500 cause Marvel and Netlfix to pull The Punished panel and delay the release of the series. All sensible moves in light of the subject matter. Any other outlet would be in mad dash and scramble to fill the air with something as massive. Marvel? They filled the hour long presentation with the first screening of Joe Quesada Presents: My Chat with Stan Lee. 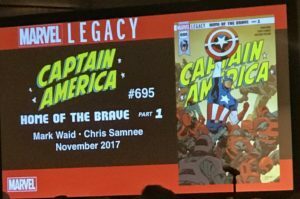 The presentation was introduced by Marvel’s Chief Creative Officer, Joe Quesada, and the documentary, which was filmed earlier this year, let us crawl around inside the brain of comic book legend and Marvel royalty, Stan Lee. How is that for one-upping your own ambitions?!?! Let’s talk about Joe Quesada for a second. This man has hustle. In the 2 full days I was in the Javits Center, I literally saw him everywhere. 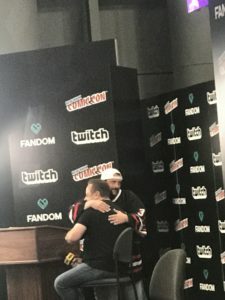 Sitting with Kevin Smith for an interview at the NYCC Live booth, now he’s over here signing comic books. 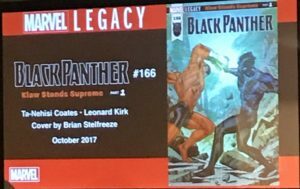 Wait, now he’s moderating this Stan Lee documentary; wait sorry, he’s over here in this panel and this one and this one. Impressive. And, you know what? He’s extremely likeable. 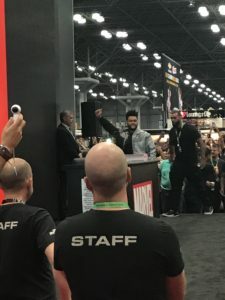 While shuffling down the queue for comic book signings, I took an opportunity to pick his brain for a few minutes on his role at Marvel and a brief chat on The Punisher and he was very accessible and unguarded. 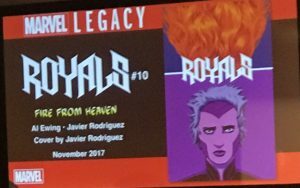 In the panel I am about to focus on below, Quesada moderated the talk but also spoke passionately during the Q&A session about writing and creating comics. It was very sincere and you came away thinking this guy loves what he does and is thankful for it, everyday. Which makes me like him and Marvel even more than I did before. As noted above, the real purpose of this post is to relate to you upcoming news on Marvel Titles in the Comic Book-verse. 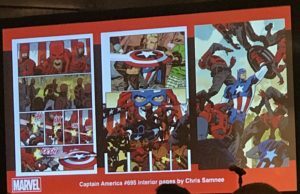 The state of affairs was presented in the Joe Quesada moderated panel, “Cup O’ Joe Presents: Marvel Legacy Avengers.” The “Cup O’ Joe” panels are a staple of the Con circuit because again, Quesada is everywhere. So read on, trusty comic book nerds. Excelsior! 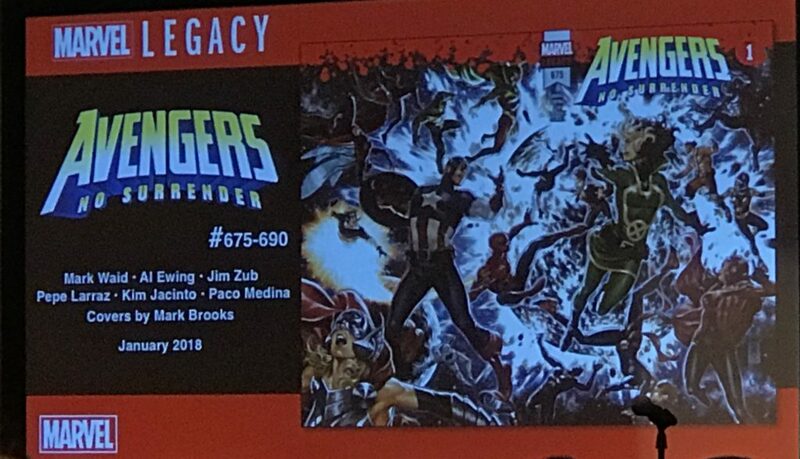 Launching in January 2018, all existing Avengers titles are being folded into this new arc, Avengers: No Surrender. 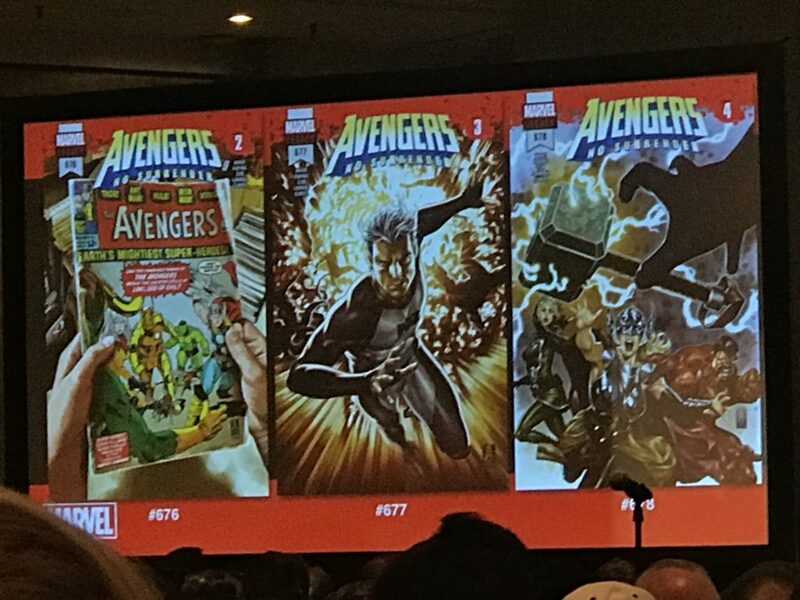 The first 4 covers were released at NYCC, and we learned that Avengers: No Surrender will occupy 15 issues. 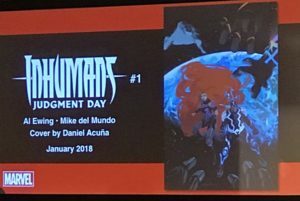 According to Marvel Executive Editor Tom Brevoort and Al Ewing, one of the co-writers for the series, No Surrender will bring together the Avengers, the Uncanny Avengers and the U.S. Avengers titles. 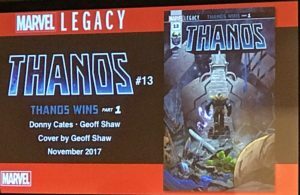 Some 26 characters will be tracked through the series and the panel promised that pretty much anyone who has ever been affiliated with the Avengers will come into play at some point. 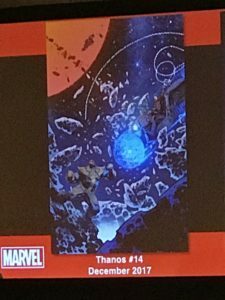 The issues will come out weekly over three months and will be co-written by written by Mark Waid (current writer of Avengers), Al Ewing (current writer of U.S.Avengers) and Jim Zub (current writer of Uncanny Avengers). 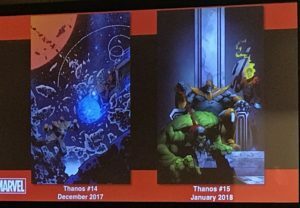 Actual plotline was scant but Marvel has referred to the arc as “The Beginning of the End” in promotional material and the word “epic” was used several times during the panel. 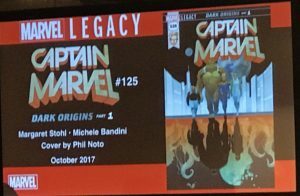 Starting in September 2017, Marvel began to re-launch some of its biggest, most core titles under the banner of Marvel Legacy (following a massive one off which endeavored to explain the history of the Marvel Universe). 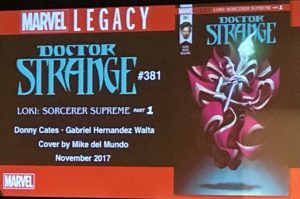 Earlier i nthe Summer Marvel announced some 52 titles will be getting the Legacy treatment but that number will likely end up higher with Doctor Strange and Captain America and other being added into the fold post the announcement. 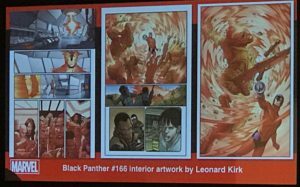 Coming out between now and January 2018, we saw cover and inside art for new storylines in Captain America (fresh off the divisive but well selling “Secret Empire” storyline), Royals, Inhumans, Black Panther (the return of Klaw! ), Doctor Stranger (Loki is the Sorcerer Supreme!! 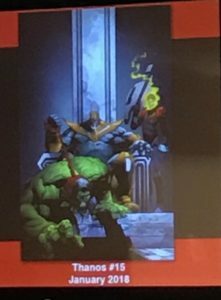 ), Thanos (sure he wins but things aren’t going great for the galactic ruler), and Captain Marvel. 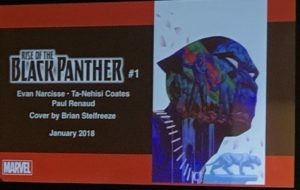 An origin story of T’Chala in his earliest days as king of Wakanda, from current Black Panther writer, Ta-Nehisi Coates, and co-writer, Evan Narcisse. 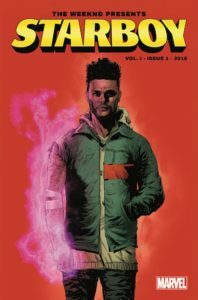 Rise goes on sale in January, right before Black Panther the movie comes out. 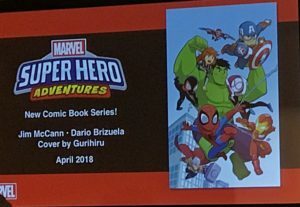 Launching this Fall, Marvel’s Super Hero Adventures is a line of early reader books focused on introducing the youngest readers to the Marvel Universe. 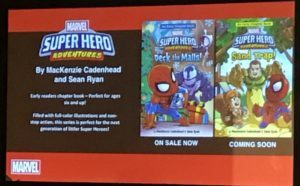 Each book also includes a short comic strip at the back of the issue – teaching kids how to read comic books from an early age. 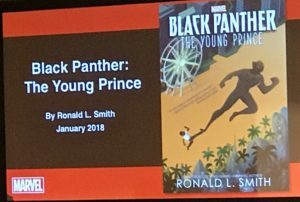 For the older, Young Adult crowd, Marvel is coming out with the two novels in January 2018: Black Panther: The Young Prince and Runaways: An Original Novel. 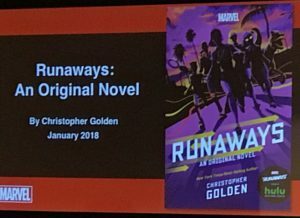 I am sure the arrival of the Black Panther movie and the launch of the Hulu show, Marvel’s Runaways has nothing to do with these release dates. Its an exciting time to be a Marvel fan, with new innovations launching in both their comic book titles as well as their ever expanding television properties (off the top of my head, I believe there are no less than 10 different Marvel shows on TV right now across move than 5 different broadcasters/streaming services) and the close of Phase 3 (and launch of Phase 4) of the MCU in the movies. 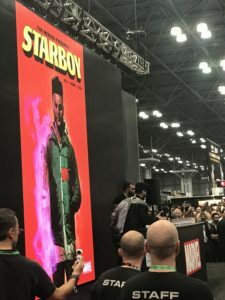 Stay tuned to Pop Culture Review as we continue our recap of the best of this year’s New York Comic Con as well as some additional commentary on Marvel and its people. Til next time. Excelsior!